China’s Vitamin E industry witnessed a downturn in prices and a decline in gross profit margins in 2014 due to weak demand from downstream markets, and competition in China’s domestic market is likely to remain fierce this year, according to new research by market research firm CCM. In March 2014, DSM shut down production to undertake a major overhaul of its production line and Zhejiang NHU Co., Ltd. also raised its quoted price for VE. Together, these events pushed prices up to about USD17,924/t in April. Prices began to fall in June because of abundant supply and weak demand from downstream markets. According to CCM’s research, the average market price of VE fell from USD13,346/t in October 2014 to USD10,365/t in January 2015. The Chinese Yuan appreciated over 10% against the Euro in November, which had a negative impact on China’s Vitamin E exports to Europe. VE prices were boosted slightly in January as several manufacturers undertook plant maintenance, but prices are still expected to drop slightly overall. Throughout 2014, VE supply greatly exceeded domestic demand, and this will put manufacturers under a great deal of pressure in 2015. For example, Jilin Beisha Pharmaceutical Co., Ltd. transformed its VE production line in 2014, increasing its capacity from 1,000t/a to 10,000t/a, but isn’t currently reaping the rewards of this expansion. 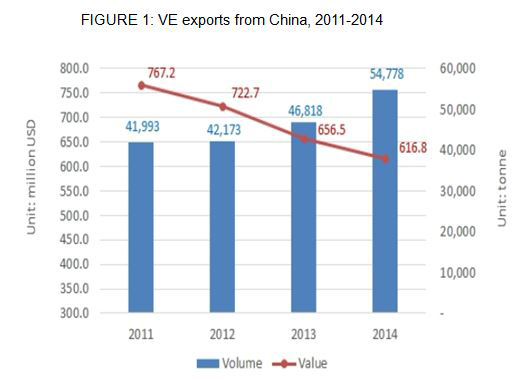 According to data from China Customs, VE exports increased between 2011 and 2014, but its export value continuously decreased over this period, indicating that the profitability of Chinese VE products is weakening in the international market. Indeed, industry insiders that we have spoken to have suggested that the gross profit margins of domestic VE industry have fallen from 70% in 2008 to less than 40% in 2014. Guangzhou CCM Information Science & Technology Co., Ltd. 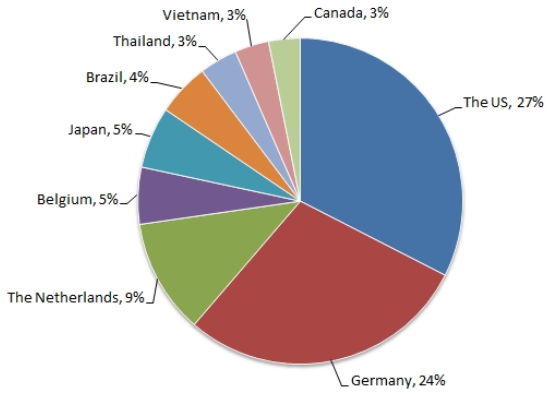 This article was provided by CCM, a leading provider of data and business intelligence on China's chemicals market.